Welcome to The Pembroke, Public House and Lounge, situated in the center of Earl’s Court, on Old Brompton Road, minutes from Earls Court and West Brompton stations. Showing live sport from Sky & BT Sport. Don’t miss a minute of action, on all our big screens. Earls Court’s best kept secret, our roof garden. The perfect, (and in our opinion the only) place to enjoy the best of the great British sun. Welcome to The Pembroke, Public House and Lounge, situated in the center of Earl’s Court, on Old Brompton Road, minutes from Earls Court and West Brompton stations. The Pembroke opens its doors at 12′oclock Monday to Saturday. Sundays we open at 12 pm for brunch, roasts and Bloody Mary’s and our infamous ‘Hangover Club’. We offer a relaxed and elegant backdrop for coffee, lunch, romantic dinner or group drinks every day of the week. This historic Public House offers an intimate dining room and open kitchen, vibrant bar featuring premium craft beers. Upstairs is a beautiful lounge bar boasting chesterfield sofa’s, slouchy arm chairs and an 8ft projector screen, which will be used for cinema events, large sporting fixtures and classic comedy during our hangover club. 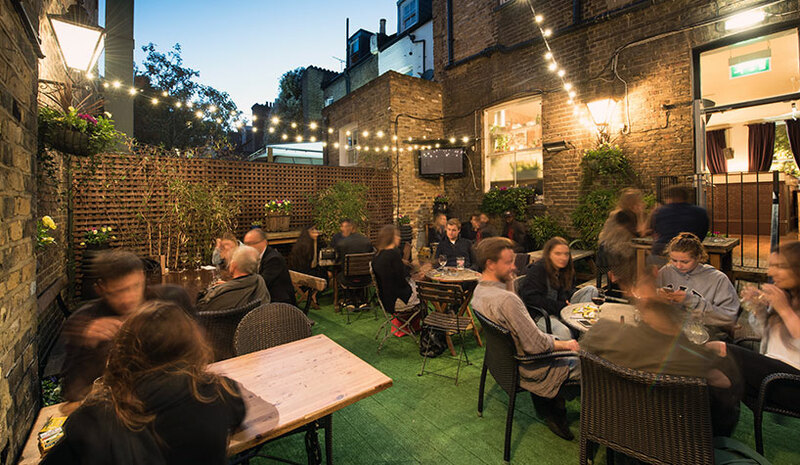 Alongside the lounge, we also have Earls Court’s best kept secret, our roof garden. The perfect, (and in our opinion the only) place to enjoy the best of the great British sun. Alongside hosting in-house events such as stand-up comedy, cinema evenings, wine tastings and breakfast clubs, The Pembroke is the perfect option for private events and functions, from sit down meals, canapés or secret cinemas. Our team will be able to put together the perfect evening for you. Book a table with us to make sure that you don’t miss out.